County in 2016. But what we suffered in tardiness, we made up for in quantity. 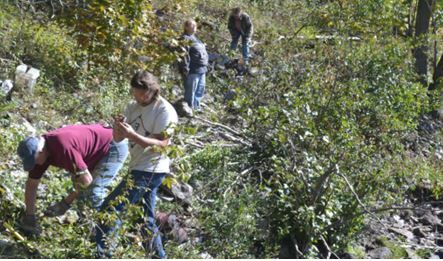 The trip was four days long and included seven separate collecting sites (one, Rose Road, was visited by members on three separate occasions over the 4 days). Several of us stayed in a rented home on Star Lake, owned by Anita Persson, wife of George Persson, who helped us with the Benson Mines visit during the trip. The trip was not scheduled to start until Thursday morning September 17th, but Bill Chapman and I had arrived in Star Lake early evening on Wednesday and we decided to take Bill’s black light to Rose Road in Pitcairn for an early start. As always the lower area, known to many as the purple diopside mound (or PDM), lit up bright yellow under long wave with the mineral scapolite and the albite at the “wollastonite skarn” (or green diopside mound) lit up red under short wave. The large “dirty” gray streaked marble boulders less than 100 feet uphill from that second location continue to be intriguing from a UV perspective. 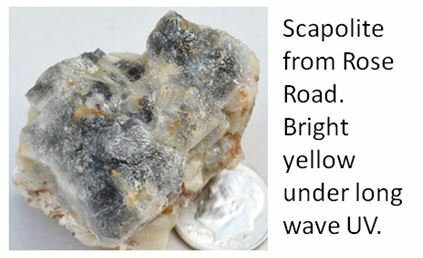 The rocks are not too impressive during daylight, but sparkle with multi-colored distinct minerals at night. Blue and green fluorescent minerals occurring within the grey streaks contain diopside, but are also sprinkled with amphiboles that may be best simply labeled as Calcium Subgroup amphiboles. 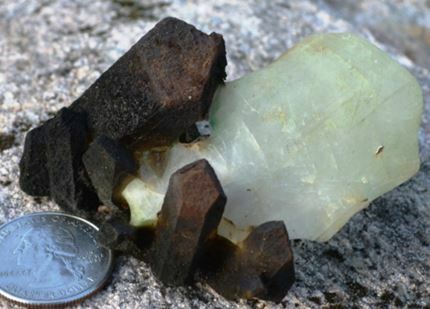 Some may be further characterized as pargasite (Steve Chamberlain, pers. comm.) and others may tend more towards edenite, or even fluoro-edenite, in composition (April 2015 WCGMC News) , very tough to tell. There is also an associated mineral that is pink under short wave, but hard to detect in daylight. Rose Road mineralogy is indeed interesting and there is likely much more to be discovered and learned. Back to daylight collecting, we ventured to Balmat on Thursday where geologist Bill DeLorraine guided us to the dumps behind the St. Lawrence Zinc Company Balmat #4 Mine. 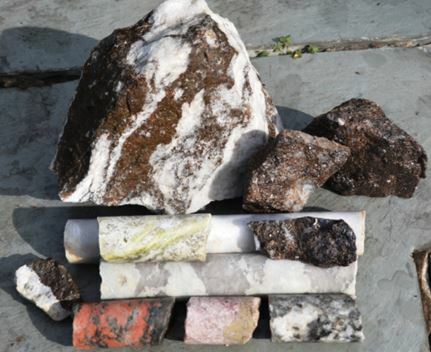 In addition to collecting marble laced with red-brown sphalerite, the dumps feature colorful cores of marble or various colors, serpentinite, and other metamorphic hosts that are drilled while assessing and following the elusive lenses of zinc ore.
Spoils from Balmat: Large piece is sphalerite laced marble, with massive sphalerite to the right. Greenish core is serpentinite resting on two marble cores, one laced with gray diopside. Calcite of various colors in the 3 cores in front. The longest core is 9” long. Thursday afternoon it was time for the first of three new sites for WCGMC. The Owen property (Walter, Rock and Gem, 2013) is only a bit over a mile from the well known Powers Farm in Pierrepont, and like that tourmaline site it is a privately owned fee site. But that is where the similarity ends. For starters, although I had been to the site two years before on a Rochester Academy of Science trip, I was not 100% certain I could locate the small and new diggings on a site some 400 yards off of Irish Settlement Road. To add to that bit of apprehension, we were joined on Thursday and Friday by members of the St. Lawrence Gem and Mineral Club so I was “leading” additional folks “into the wilderness”. I should not have worried. A member of the St. Lawrence Club knew the way and a faint trail had been developed and marked with flagging. Mineralogically, the site also differs from the nearby Powers site. While tourmaline (specifically dravite) is prevalent in the prograde regional metamorphic mineral assemblage at Powers, the Owen site has yet to show evidence of tourmaline. Rather, the prizes there are peristerite (iridescent albite) that is often intergrown with orange calcite, scapolite, and smallish titanite. I did find some mildly iridescent feldspar and one half inch scapolite for a location piece, but the best formed minerals I found were pyroxenes. Until properly identified I am tentatively calling them diopside. Many terminate fully and they are often clustered. Friday we pointed our wagons towards Harrisville and the Valentine Wollastonite Mine. Vanderbilt Minerals often dumps fresh rock outside their gate as a courtesy for passing rockhounds, but on this day they were willing to accommodate the two clubs with a visit inside the well know quarry. Mine superintendent Ward Bacon took us to the mine dumps inside the location. The brilliantly blue calcite that mineral collectors seek is a scourge to the miners. It tends to interfinger with the bright white wollastonite reducing the purity of the product and negatively affecting the quarry’s economics. 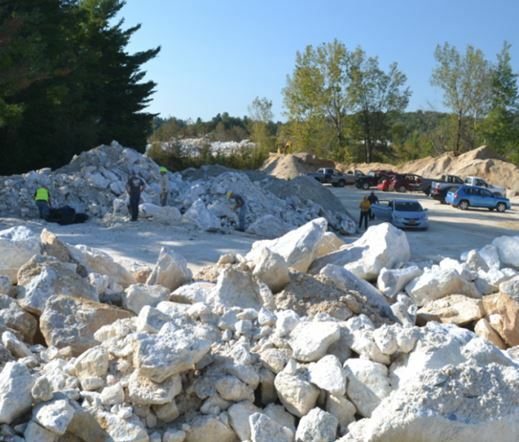 Hopefully we took more calcite than wollastonite such that our visit did not impair the operation of one of only two operating wollastonite mines in North America (Dec. 2014 WCGMC News). Inside the Valentine Mine area, bright white wollastonite piles brighten the foreground, but notice the activity is across the way where blue calcite is plentiful. Friday afternoon we travelled to the southern Adirondacks and a site known as a field trip stop for university geology departments. They venture to the Moose River location for a look at one of the finest outcrop exposures of prismatine in the eastern United States. 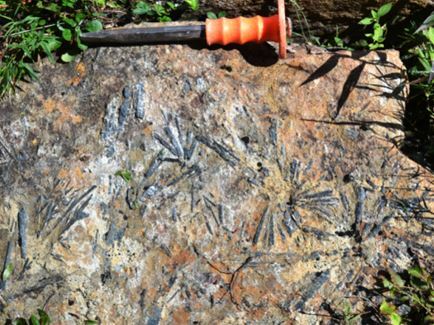 Prismatine rosettes within garnet-cordierite gneiss: And the chisel was only used as a scale. This outcrop was not “sampled” nor am I divulging the exact location in this note. It is a geologic treasure for future students to see; besides it would be next to impossible to obtain samples off this hard rock face. Our reason to visit this location was to seek quartz crystals from veins cutting quartzite (see photo in lower right of this page). While many of us were looking along the river bank, Craig Stephens made the find of the day (or perhaps the trip) wading in the Moose River. My field picture (top on middle column), and with the piece set atop a gneiss boulder, does not do this wondrous piece justice. Terminated Quartz crystals with blackened surface due to manganese oxide and perhaps algae are held together by calcite that has been naturally etched in the river. Not sure what this will look like when cleaned, or for that matter whether it should be cleaned. It is a glorious piece indeed. 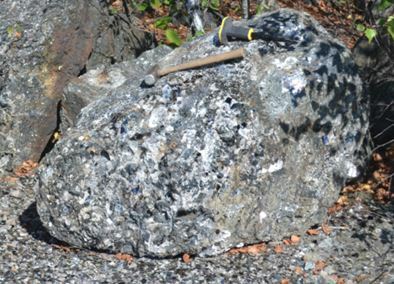 In addition to the quartz, the Moose River site offers grey to blue calcite with embedded diopside, a skarn I presume, although we only found float pieces. Saturday, in a repeat from last year, we were joined by Dr. Mary Roden-Tice’s SUNY-Plattsburgh mineralogy class while visiting Benson Mines in the AM and Rose Road in the PM. Both locations have been have been highlighted at length in previous newsletters (see links provided by clicking on the location name), so we’ll just include a couple pictures from this year’s visit here. How many collectors can you spot on the Benson Mine dumps? 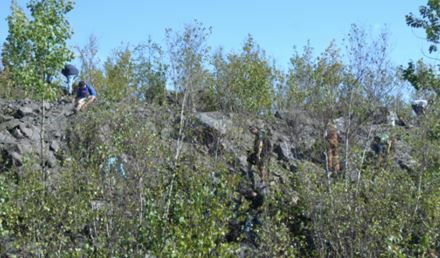 They are looking for muscovite-bearing pegmatite amongst the sillimanite-magnetite gneiss boulders. This pegmatite boulder at the northern end of Benson Mines has suffered the wrath of many a collector trying to remove a sizable specimen of muscovite and quartz. Witness the spread of mica flakes surrounding the resistant boulder. We returned home Sunday, but not before a trip to Talcville for hexagonite. Yes, Ken Rowe reported last month that the large dump site he frequented had been reclaimed, but thanks to Jerry Curcio’s perfect directions we did find a section along the Oswegatchie River where purple tremolite and talc could be obtained, as potrayed in the cover photo of this posting. From left to right: Ken, Craig, Sue, and Linda collecting hexagonite, but hopefully not poison ivy, along the Oswegatchie River near Talcville.